Harlem Yu to hold I Wanna Give You concert in Penang come October! Harlem Yu, who is well known as the “Godfather of Pop Music” in the mandopop scene, ready to bring the house down with his all new solo world tour after being away from the music scene the last 7 years. Seems like “7-year-itch” has caught up with Harlem (he joked) and that this concert will be a good chance for him to sing and perform his heart out once more. With this tour, Harlem has successfully performed to numerous sold-out shows in China. Fans are in for a good time and can look forward to walking down memory lane with Harlem, recollecting the many hit melodies over his 25-year music career. 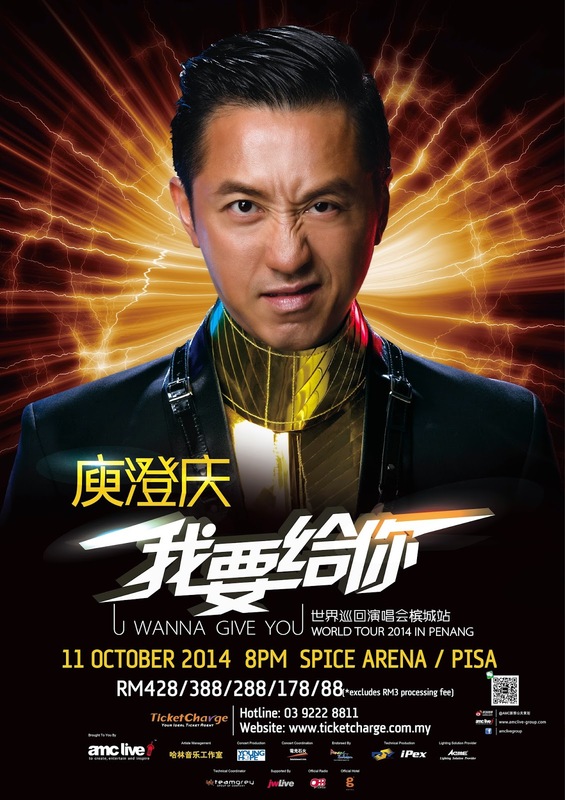 Harlem Yu I Wanna Give You World Tour 2014 is set to rock Penang on 11th October 2014, 8pm at SPICE Arena (formerly known as PISA). This concert will be Harlem’s first ever large-scale performance in Penang and also the first stop in Malaysia! Harlem is no doubt a master of all trades – the award-winning singer-songwriter has stepped up as music director for this concert, and has even made himself a name in variety show hosting. His latest accolade boasts him as a well-loved and popular judge and mentor among contestants and audience, in the widely popular reality-TV singing competition, the Voice of China. The I Wanna Give You concert will showcase Harlem’s entire music journey in a distinct creative segments, the first of which narrates the beginning of this journey with his original rock compositions. In another segment, Harlem will be performing some of his widely acclaimed works, including Sad Singer, Fate, and Quietly. Recognized especially for his wacky and playful approach to music, Harlem dedicates yet another part of his concert to performing re-arranged versions some of his songs, as well as his own renditions of songs from various other artistes. Fans can also anticipate Harlem to bring on his best show with hit songs like The Moonlight That Can’t Be Turned Off from his newest album, Tidal Wave which won a Golden Melody Award, and Love Against Will, the famous opening theme song of popular idol drama Meteor Garden. Accompanying Harlem on this tour is his beloved partner and crime responsible in helping him craft many of his original works – his guitar. Fans are in for a treat, as Harlem will not only be performing on his guitar, but also on one other Chinese instrument. A veteran in both music and television hosting, Harlem boasts a string of widely popular songs and is a pro at live performances and talk shows – no wonder he boldly declares in his concert theme I Wanna Give You – as if to proclaim he is laying out all his talents and abilities before his fans. Harlem’s concert promises a night of great music, fantastic performances and fun interactions, and fans can prepare to be shuttled between the experiences of a live concert and a live variety show program, all helmed by the man himself. Harlem Yu I Wanna Give You World Tour 2014 in Penang is proudly brought to you by AMC Live Group.